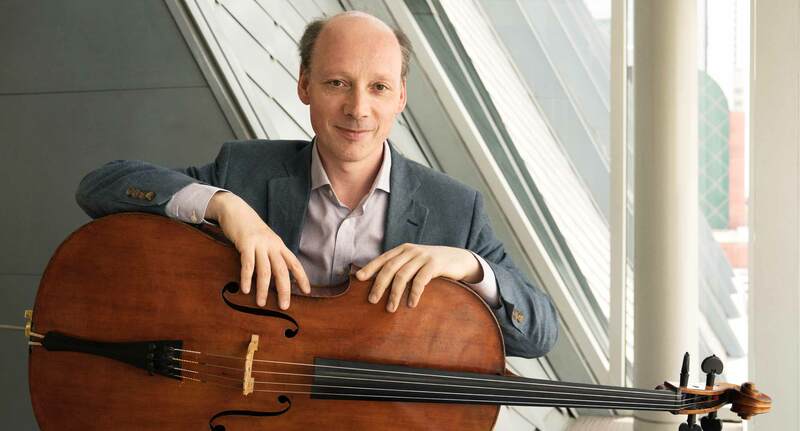 Cello faculty Clive Greensmith, originally from the UK, teaches Conservatory and Music Academy students. He has been at Colburn since 2013. This interview has been lightly edited for length, clarity, and style. How and why did you come to be at Colburn? I played in a string quartet, the Tokyo Quartet, and in 2013 the more senior members decided they would retire. With Martin Beaver and myself being the younger members, we decided we might think about continuing the group, but before we could really formulate real plans, [President and CEO] Sel Kardan came to a presentation concert we were giving in New York City. He invited us to come and give a couple of classes here in 2012. And then pretty much after we arrived and did a day of teaching, he and Richard Beene, who was the dean at that point, offered us newly created positions to co-direct the chamber music program. So, we then decided we close the shop down and retire, officially, the quartet and come here. And so that was in 2013, in the fall. What has it been like teaching here in the last six years? For me, it’s been a joy. There’s no other institution that I’ve worked for that has given me the support to teach at the highest possible level. Of course we have beautiful facilities, but it’s really all about the students here, and about the ability we have to bring in that top level of talent. It’s something you can really do here to influence the young people, to support them, and to see them flourish. We are full-time faculty. I’m here all the time. Of course, I go away for concerts, but the school is the most important thing that I do in my life. Here, It’s a long-term commitment for the student’s development, over a long period of time, that will go on benefiting them in the future. It’s a contract you enter into with the student that you’ll be there for them at every point. What do you hope your students gain from studying with you? First and most important is that artistic expression, and to develop their whole, unique capabilities, their own voices. I don’t want clones. I don’t want them to sound and look like me when I play, but I want to develop whatever they have to offer, to open them up, to make them more inquisitive, to question why they do things, to give them confidence. To make them musically alert enough so they’re totally absorbed in what they’re doing, to understand a wide variety of musical styles and expressions that give them the tools to be able to express that. You can’t just look at the cello and hope that the sound is going to come out the way you want. You have to know how to manipulate the instrument at a very, very high level, under the strain of lights and cameras and audience. Do all of that, and have the craft to be able to say what you want to say. I come from a family of teachers, but that’s less relevant. Why I love teaching is that if I play a concert, if it’s a good night and people clap, you get taken out for a meal by the promoter, and people greet you and you feel like you’ve done a good deed for the composer—that’s great, but it’s over. And the next day you might have a concert again, or might not. You play a different piece. In a way, I feel like that’s a bit ephemeral. But with a student, when you teach, it’s more meaningful to see them grow in confidence, and deepen their awareness of the music, and to become self-sufficient, and for that to keep going and lasting to support them in the years that ensues. So I feel like it’s more rewarding to teach, and it’s in a way more permanent. So I feel like I’ve given them something. And also I love my subject. I find I discover more about cello music through teaching than I do often playing myself, because when you look at it and look at somebody else and their journey, you get drawn into them. There’s the psychological aspect, there’s the emotional aspect, there’s the leading a younger person, which is a great responsibility. And then there’s the discoveries that you make to get about music, in a way that might appeal or speak to them. We’re dealing with beautiful art here. There’s nothing better than to be sitting in a room here, in the studio. What is it like balancing teaching with your active performance career? It’s very hard. There are only so many hours in the day. But the relationship between my own performing career and the students here is very important. I feel I can bring the experiences that I have on stage to the studio here, and help them because I’ve been through it myself. And I’m still dealing with those challenges of being on stage. I think it helps me in my teaching. I can understand what they’re going through. I know the practical pitfalls of many of these pieces, because I’ve played them a lot. How do you think the classical music world has changed since when you first started playing? I was brought up in the UK, and I left 21 years ago to come here. It was a completely different world. There wasn’t the technology that we have now at our disposal to instantly share what we do. There was no YouTube. This instant access now has meant that what we do is on display. It means that music has become more visual. It used to be an aural experience, now it’s a visual experience. There are less offers for you to have a 15 album contract with the major recording companies, because they don’t have the money now. There are less jobs now. Open borders. You’ve got Eastern Europe coming west. China has opened hugely, of course. And countries like South Korea, you see that the level of teaching everywhere has become very, very high. So as a result, I think it’s way more competitive now than it was 30 years ago. How should today’s young musicians deal with these changes? The young musicians today have to be at the top of their game as instrumentalists. They have to be very sure of themselves, and they have to be very realistic about how competitive it is. I think it’s harder now to make it in the career than it probably ever has been. Let’s take a young ensemble. I ask this of a young group: What is it that you think you do better than another group? What is it you stand for? Knowing what you stand for or who you are or what you can bring is, I think, very important, because then you can recognize that in the player. They’re striving for something. It’s not just another good player. They actually have to have a sense of missionary zeal. A kind of belief in their role as a communicator and as an artist. That would make me want to choose them for whatever it would be. You can’t be nonchalant about that. The weekly Saturday Spotlight series highlights our outstanding students, faculty, and staff from across the school. Read other spotlight interviews.